Camping on the shores of Lake Garba amid the verdant La Rocca Park is indeed a great way to unwind in picturesque and serene settings. Suitable for guests across all age groups, the La Rocca Camp is replete with modern amenities that enhance your holiday experience. Irrespective of whether you choose to camp in a mobile home or apartment, contact Lux-Camp for a memorable getaway at this luxury camping site. Why should I Camp at La Rocca? Far from the madding crowd, this holiday camping site proves an ideal location for those seeking calm and quiet in a plush setting. Luxury camping at this site offers the best of comfort, entertainment and activity choices. Kid-friendly play areas, pools and entertainment options at this holiday camping site make it an ideal camping holiday destination for families. 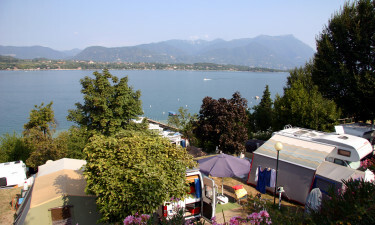 The walking trails at La Rocca Park, the scenic San Biagio Island and a host of other attractions add to the appeal of this luxury camping site. 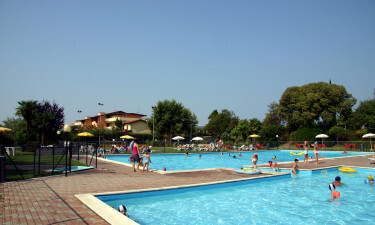 The swimming pool at the site, flanked by parasols and recliners, makes a great venue for relaxation, while the beaches, a stone’s throw from the holiday camping site, compete for your attention. Facilities for different ground games are also bound to draw you out from the comforts of your mobile home. 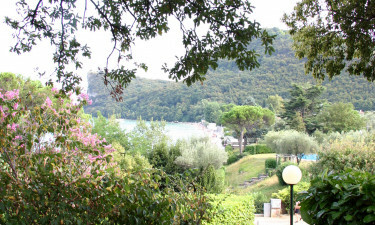 The restaurant and bar at the campsite complete your luxury camping experience in Italy. However, the adventurous are bound to find a visit to the nearby towns of Manerba, Desenzano and Montinelle more rewarding.